When I saw this recipe highlighted on Food52, I knew that I had to make it soon and I knew it was going to be amazing. 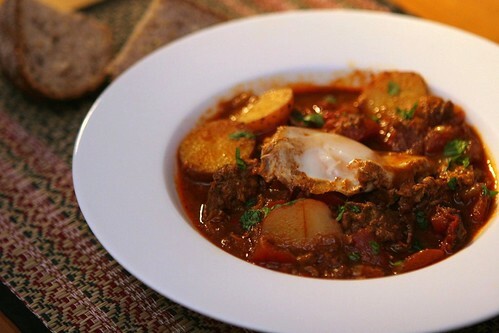 Sausage and tomato sauce with Moroccan spices and poached eggs? Yes please. I changed the recipe a bit, reducing the amount of oil, using Spanish chorizo instead of merguez sausage, and substituting potatoes for half the sausage. It really was fantastic - we gobbled up half of it for dinner on Saturday night and the leftovers were even better for lunch the next day. And I might have eaten the last remaining bit for breakfast today. This is one of those standout dishes that I'd happily eat for every meal of the day - I already can't wait to make it again! Some notes: if you are sensitive to heat, you might want to reduce the amount of harissa. The 2 tbs in the recipe makes for a pretty spicy dish. Also, if you would like to make this vegetarian, you could use chickpeas, soy chorizo, or more potatoes in place of the sausage. In a large frying pan, heat the olive oil over medium heat. Add the onions and saute until golden. Add garlic and cook for 2 minutes. Add the sausage and potatoes and cook until sausage is almost fully cooked through, about 3 minutes. At this point, spoon off excess fat if you want. Stir in ras al hanout, smoked paprika, and salt and cook for 1 minute. Add the tomatoes and harissa and cook until sauce has thickened slightly and potatoes are tender, about 5 minutes. Make several shallow pits in the sauce and crack eggs into the pits. Cover the pan and cook until the whites are set but yolks are still runny, about 6 - 7 minutes. Sprinkle with cilantro and serve immediately with crusty bread on the side. This is absolutely my kind of meal - looks amazing! Just made this tonight - delicious!! This looks delicious and I know my husband would be happy if I made this for breakfast, lunch, or dinner! This reminds me of shakshuka, but with sausage. I love Moroccan flavors, I need to cook with them more. Great idea!! 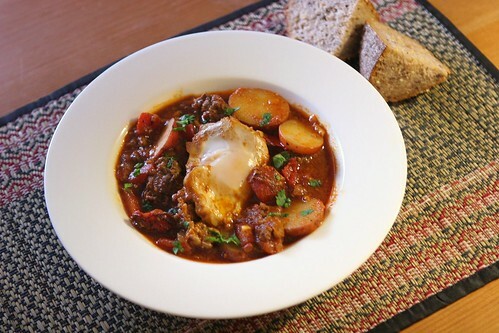 I'm always looking for easy meals with eggs - I love the idea of pairing them with a ragout! Poached eggs on anything equals success. I wonder if I could adapt this to use some stew beef I have frozen? I love the flavors here. Absolutely - I think it would be great with a number of different proteins. I LOVE Moroccan food- this looks great! I'll be making this with my favorite vegetarian sausage. Anything moroccan always sounds ideal to me.